Choosing a kitchen layout is a trickier task indeed; especially when you have a variety of design options to choose from. What makes one confused? Availability of space, overall layout of your house, total cost required to make a particular design and various other technical factors just become overwhelming. However, hiring a top construction company in Pakistan can be a great assistance as the professionals here can help you choosing and designing the best kitchen layout. What makes up a Kitchen’s Layout? A kitchen’s layout is determined by the shape it takes by the arrangement of countertops, major appliances and storage spaces. A layout is chosen while keeping the design and functionality perspective in view. Let us get into some basic kitchen’s layouts. A L-shaped kitchen layout is best suited for the small and medium-sized kitchens because it provides considerably bigger working triangle by providing a corner space. The countertops on the two adjacent walls, which are perpendicular to each other, making a L-shape form. Choosing this layout for medium or small sized kitchen is useful in a way that it provides enough space to a cook, to walk around in triangle – from sink to workstation and towards the refrigerator. To best utilize the larger space kitchens, using a U-shaped layout is just perfect idea because it provides plenty of storages spaces, above and below the countertops on the three adjacent walls. A cook can freely walk around and even you can install different workstations on two of the countertops for a quicker cooking. Moreover, you can also utilize the storage spaces to conceal fridge, microwave and oven. Thus, despite storing a lot of items together, your kitchen looks sleek and clean. G-shaped kitchen is a little extension of the U-shaped kitchen. Such type of layout is good for larger kitchens as it has three full and one half counter or less than half countertop. 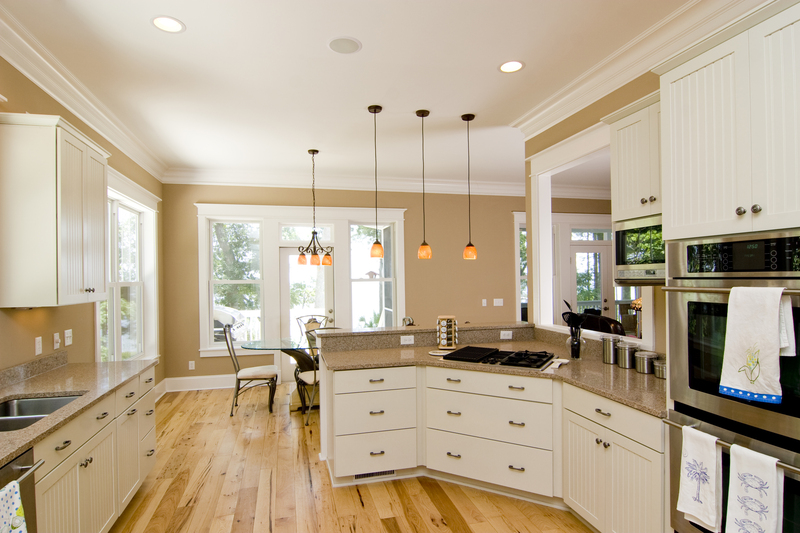 You can keep it as an open kitchen or a closed kitchen can also use the same layout. Usually, the layout is more suitable for the open kitchens. Island kitchen layout signifies the luxurious large space cooking areas because these provide a dining as well as storage space in the middle of the kitchen. By placing stools around the island, you can use it to enjoy meal or coffee. It is all about your choice – here you can store beverages, cook food or place a sink. When an island is placed in an L-shaped kitchen, it gets converted it into a horseshoe layout; whereas one-line kitchen with an Island gets converted into galley style layout. Islands are good to add decoration and functionality in an area but these are not equally suitable for all types of kitchens. For the smaller cooking places, island is never a good choice because it hampers you to walk around freely. These are highly functional for smaller-sized kitchens. All the layouts stand against a single wall where you have countertops, sink and workstation. Here instead of using a triangle walk around area, you need to work in a straight line. To increase the storage, you can intelligently create cabinets and storage spaces so that these could provide you enough space to keep your items or accessories safe. This layout takes the shape of two parallel lines. On each of the counter top, you can place a workstation for separate cooking work. These also provide enough storage space and spacious pathway to pass through easily. If you want to get any of these layouts for your kitchens too, just consult an interior designer in Pakistan because, he can give you suggestions while keeping in view, the functionality, decoration and the space available.